Today, in the rain, we finally spotted a Maranello4 in Central London. In the metal (sorry, plastic) it looks marginally better than in pictures on the web site. 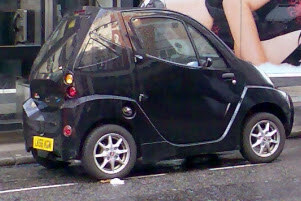 In particular, gloss black paint seems to suit the narrow, bolt-upright stance rather better than the two-tone scheme that is no-doubt meant to disguise the car’s height, but actually ends up reinforcing the resemblance to an overgrown mobility scooter. 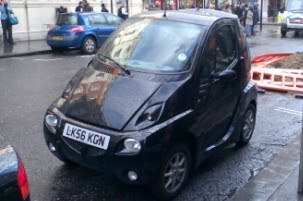 With its blacked-out rear windows this car looked cool. Almost.